Named after Orwell’s eponymous final essay in London’s Evening Standard about the perfect brewpub, it’s a fitting name as Victoria’s oldest-feeling brewpub: no Victorian architecture but the “barmaids” & atmosphere are friendly & welcoming, it’s quiet enough to chat, and there’s a wide variety of food. The place feels lived-in without being schlocky, a neighbourhood pub in all the best ways. It’s a welcome break from the predominant modern style of breweries — though if you hate music bingo then it’s truly hell one night a week. 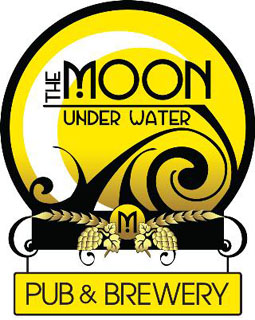 But what makes Moon Under Water special isn’t the beer, which is fairly mediocre. What used to be best — Potts Pils and Creepy Uncle Dunkel — don’t merit seeking out anymore but they’re still good. Other beers we enjoyed — a Sang Du Merle sour, a Mango Sour, the Lighter Side of the Moon pale ale —speak to the fact that there’s a decent amount of things one *could* like from Moon Under Water. But ultimately, the options on tap rarely stray from the handful of standard styles one expects everywhere. While they’re experimenting with sours and barrel-aging, they have yet to produce anything worth a trip on its own (unlike nearby Hoyne and Driftwood). And while everyone in our group had one beer they enjoyed, it was hard to get unanimity in our ranking group on any singular offering; the word “inconsistent” was said more than once. Moon Under Water has an important niche in the scene and in our hearts. But strip away the good branding and distribution, and it’s little more than a blue collar Swan’s in a worse location. Being a frequent visitor of Moon, I have to say the ‘quiet enough to chat’ part of your review is a stretch. Moon unfortunately suffers from some horrid acoustics which, if the pub is full, make holding a conversation almost impossible.